The history of Rajputana is eulogised through its ballads which sing the praises of its legendary warriors, heroes such as Prithviraj Chauhan, Rana Sanga, Hemu, and Rana Pratap. They were known for their courage, their chivalrous ways and their Rajput pride. They were amongst the early Hindu kings to have resisted the Islamic onslaught from Central Asia, Afghanistan and the Middle East. Prithviraj Chauhan was the Rajput ruler of Ajmer and Delhi. He inherited his kingdom from his maternal grandfather, a Senna king who ruled from Bengal. His love story with Princess Sanyogita and his battles with his in-laws (Jaichand) are a part of legend. However, he gained glory as a king who who repulsed several attacks by Muhammed Ghori of Afghanistan. Ghori was even captured in the first battle but magnanimously set free by Prithviraj. Ghori repaid the debt by attacking Delhi the following year with a larger army. This time Prithviraj was defeated, captured, tortured and killed (after he refused to convert to Islam). Prithviraj proved to be the last Hindu ruler of Delhi, which then became a Islamic sultanate. Rana Sanga (otherwise known as Sangram Singh) was another great king who extended the boundaries of his kingdom. He had lost his eye in combat, and he wore many a scar that he had received in innumerable battles with pride. However, his reign marked the entry of the Mughal, Babar, into India. Sanga was one of the many kings who invited the Mughal invader to attack the Afghan sultanate of Delhi. Sanga was under the impression that Babar would loot the Afghan kingdom and return back to his country. This proved to be a serious error of judgement as Babar decided to stay on. Sanga then attacked the Mughals, but Babar was able to defeat him in battle and establish Mughal rule in the sub-continent. Then there was Hemu (otherwise known as Samrat Hemchandra Vikramaditya). He started his life as the army commander of the forces of Adil Shah Suri. Following the death of the Mughal Emperor Humayun, he went on to become sultan of Delhi, albeit for a very short time. He was a victor of twenty-two battles and a king of practically the entire Gangetic plain. However, Akbar, the young son of the Mughal Emperor Humayun, returned to reclaim Delhi. 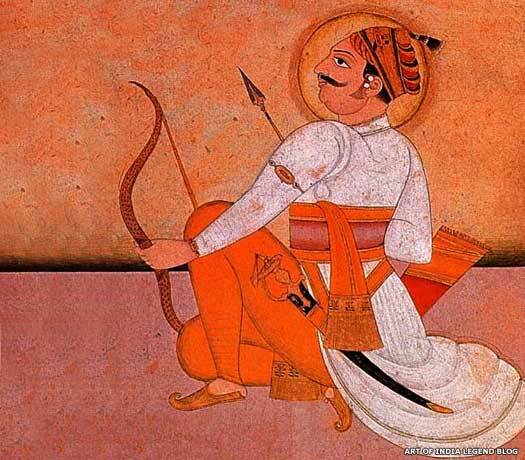 Although he was twice defeated in battle, on the third occasion a stray arrow struck Hemu and he fell unconscious on the battlefield. His army thought that he had been killed and they fled the battlefield in panic. It was then that a young Akbar decapitated the fallen Hemu with his sword and claimed victory. 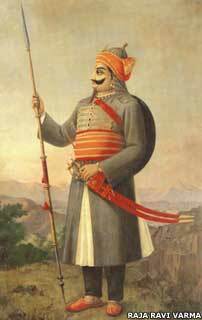 Another great son of Rajasthan was the brave Rana Pratap, who doggedly resisted the attempts of Mughal Emperor Akbar to capture his kingdom at Mewar, especially when all the neighbouring princes had resigned themselves to their fate and accepted the suzerainty of the Mughals. The proud Maharana Pratap refused to bow down before the mighty Mughal army and continued to resist them. A time came when, chased by the Mughals, the rana had to lead a fugitive's life in the jungles. He lived on the weeds and wild berries of the forest, and yet he carried on with his guerrilla-style attacks on the Mughals. To his dying day, he never surrendered to the Mughal emperor.